With its imminent publication on both sides of the Atlantic, Greatshadow is the beginning of a brand new dragon series from Solaris. 1. What was the inspiration behind Greatshadow? Greatshadow has multiple origins. In my Bitterwood novels, I took a very science fictional approach to the dragons and worked hard to treat them as biological beings that could have been produced by evolution. With Greatshadow, I’m taking the exact opposite approach and treating dragons as elemental creatures of pure magic. Each of my primal dragons is a spiritual being whose soul is intertwined with an aspect of nature. Abyss is the dragon of the sea, Hush is the dragon of cold, Glorious is the dragon of the sun, etc. Greatshadow is the dragon of fire, and his malign intelligence gazes out on mankind through every flickering candle flame. Grow careless with flame, perhaps by knocking over a candle onto some papers, and Greatshadow will devour you. Once I knew I was going to be writing about a dragon only one step shy of a god, I knew I’d need a special cast of characters to confront him. I’ve loved superheroes since I was a kid, and have written two novels, Nobody Gets the Girl and Burn Baby Burn, exploring the actions of superheroes in our modern world. With Greatshadow, I try my hand at characters with superhuman powers in an epic fantasy setting. Infidel, the central character of the novel, is a female mercenary who has been enchanted to be strong enough to pick up an elephant and has skin hard enough that most swords bounce off her. Menagerie is a shape-shifter; the Whisper is an invisible and completely silent spy, and Lord Tower, the leader of the mission to slay Greatshadow, flies over battlefields with a war hammer carved out of solidified sunlight and impenetrable armor summoned into existence by prayer. A big part of the joy of writing this book was to let my imagination run wild in crafting pulse-pounding, high-stakes action scenes where my superhuman characters slug it out with some of the most dangerous opponents ever to crawl out of the dark recesses of my brain. That said, despite their powers, I also think that the characters are grounded by very human concerns and desires. Lord Tower is nobility personified, but he struggles against temptations of the flesh. Menagerie is a highly paid mercenary with a reputation as a cold-blooded killer, but we learn that his true motivation for earning his pay is to allow his mother to live in comfort. The heart of Greatshadow is an epic romance, a love-conquers-all tale between Stagger, the narrator of the book, and Infidel, the warrior woman. All great love stories are about overcoming obstacles. The lovers cling to one another even though their families are enemies, or despite barriers of race and class, or because some epic event, like war, tears them apart. The grand obstacle in Greatshadow is the rather inconvenient development that Stagger gets himself killed in the first chapter. It gives me an opportunity to explore the topics of both love and death, themes powerful enough to stand up to my larger-than-life storyline. 2. What is it about dragons that you are drawn to? Human evolved from small primates who lived in trees and were hardwired to be on the lookout for big snakes, big cats, and big birds. If you blend a snake, a cat, and a bird together, you get a dragon. Dragons were what lived under my bed as a child, providing me night terrors. I’ve grown into an adult who views dragons with a degree of awe. In the hierarchy of monsters, I think dragons eat vampires, witches, and wolf-men for lunch. 3. Are there any particular fantasy writers that have inspired your own work? Terry Pratchett. It’s probably been almost twenty years since I first read a Discworld novel and I was blown away by the perfect juggling act of humor, flawed characters, and action, all working together to examine large philosophical questions of man’s relationship with gods, the nature of true heroism, and what elements make civilization preferable to barbarism. Reading him is both a sources of inspiration, leavened a bit by the soul-crushing despair of knowing that I’m never going to craft a novel half as good as Small Gods. 4. Aside from your own creations, who are your favourite dragons in fantasy? I would say that E. E. Knight has really raised the bar on dragons as fantasy characters in his Reign of Fire series. He follows the growth of his dragons from the moment they are hatched up all the way to adulthood when they confront their greatest challenges. If you like dragons, it’s hard do much better than this. Outside of books, I think one dragon that really stuck with me from childhood was the dragon in the Disney movie Sleeping Beauty. The witch Maleficent turns into a dragon that towers over the landscape. To this day, it’s the first image that springs to mind when I think of a dragon. I've already turned in my next book in the Dragon Apocalypse series, Hush, and am now in the middle of the third book, Witchbreaker. With Hush, I take the mythical aspects of dragons to new levels as my characters must sail across the Great Sea Above in order to confront Glorious, the dragon of the sun, who is locked in an age old battle with Hush, the dragon of cold. In Witchbreaker, I’m bringing the series back down to earth a bit, and telling the story of Sorrow, a young witch who’s lost control of her magic. 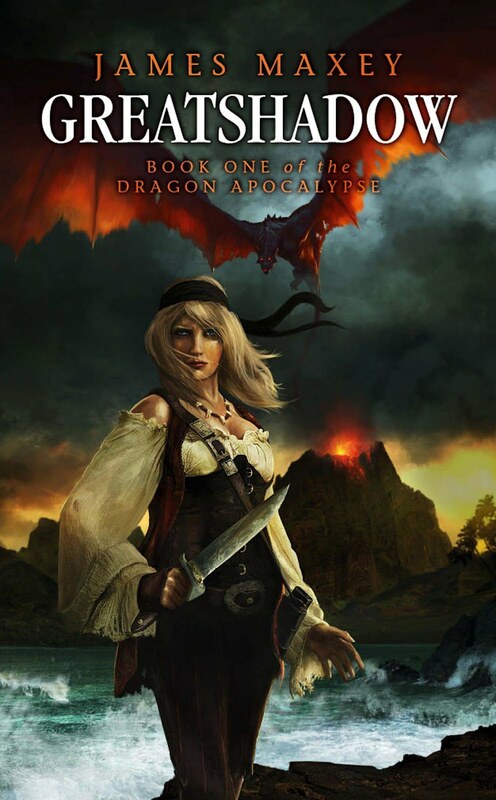 Unfortunately, her desperate actions to regain control threaten the status quo of the magical world, and catch the attention of the primal dragons. In Greatshadow, men go hunting a dragon. In Hush, our human heroes get caught in an epic struggle between dragons hunting each other. In Witchbreaker, the dragons come out to hunt Sorrow. The fate of the world is at stake in the first two books. In the third book, it’s the fate of a single person at stake, but this single person stands in the balance of whether the future will be a future dominated by dragons or men. 6. Tell us a bit about your writing process. Writing a novel is a bit like working a jigsaw puzzle where there’s no picture on the box. I go into any book with a lot of loose bits. I have characters I’d like to write about, settings I want to explore, and themes I’d like to tackle. The mystery is, how do all these things fit together? Once I sit down and start working on a first draft, I normally try to produce 10,000 words a week. My first drafts are typically pretty ugly. I often use a pottery analogy; in the first draft, I’m just scooping up clay and tossing it onto the wheel. When I’m done with a first draft, I have a big brown lump that really doesn’t look like much. But, I now have the raw material to start spinning the wheel, and in the second draft I’m able to toss out all the stuff that turned out not to be part of the novel after all, and fill in the holes of what should have been put into the story the first time through. I never show anyone my first drafts, and try to avoid even talking about them in more than the most general terms. My second drafts I show to about a half dozen volunteer readers and they tell me what they like about the story and what just isn’t working for them. I then write a third draft based on this feedback, and by this point I normally have a pretty readable novel, with a logical plot and engaging characters who grow over the course of the book. I then do one more draft where I read the book out loud in order to smooth it out stylistically. That’s the draft I normally turn in to publishers. After that, there’s usually a touch more polishing based on editorial feedback, but it’s usually fairly minor stuff. Just finished Greatshadow, it's a lot of fun :) Can't wait for the next one!